Sooooo. I have a bit of an issue with this weeks Fatshion Faceoff theme. I really like hoop earings- but, my ears aren't pierced! Its also extremely hard to find proper clip on hoop accessories! Even after years after searching, I only have one pair..... and theyare still in a box somewhere! So instead, here are a few of the pairs I like at the moment! I know its odd not to have my ears pierced- but in someways its really good! They were pierced when I was younger, but they were so sensitive I could only buy expensive plain earrings. Now I can wear almost all of them! If I can, I buy earrings like the New Look feather ones as I can easily switch them into clip-ons. 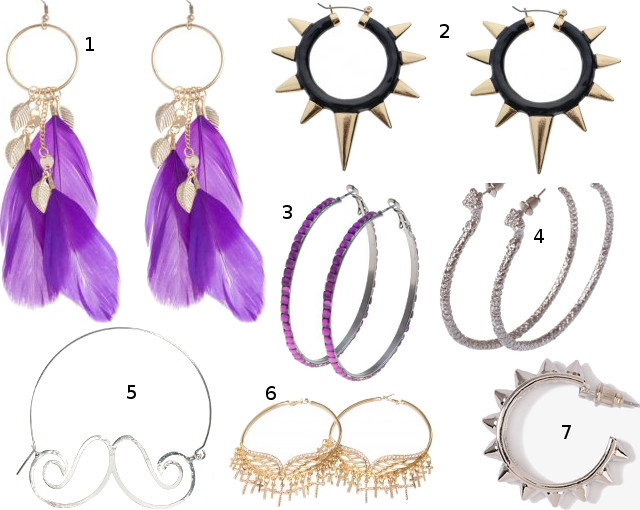 My favorites (and unable to be made clips) is the style like the ASOS Moustache hoops- how rad are those!!! Check out what my pierced and fabulous FF babes are wearing! Those mustache earrings are incredible! You probably made a good choice letting your ears close up. I had the same problem growing up and now I have half pierced ears that I have to re-pierce every time I want to wear earrings. It's so annoying I just usually forgo them. I had no idea your ears weren't pierced - I kind of assume that all girls have their ears pierced! I didn't get mine pierced till I was 17, I used to be able to wear all kinds of mad cheap and choice earrings, but now they are much more sensitive so I'm restricted to the high end earrings. The moustache ones rock! :D Such a shame you can't wear them! I have pierced ears but unfortunately they are super sensitive - I can't wear many earrings. Didn't stop me acquiring a little collection though, haha. I still have them even though I can't wear them! I usually stick to 2 pairs of studs I rotate through and occasionally switch out to other pairs for special occasions - but for no more than a few hours at a time. I have two piercings. I ripped the first piercings through when I was little and to this day I can't wear anything in them. Then I had them pierced again when I was 17, right about the old piercing. And I love earings. Have a bunch. But really into the necklace right now.